E Waste Management | Best Barcode System Pvt. Ltd.
Best Barcode System Pvt. Ltd.
Best Barcode System (P) Ltd. is glad to be part of this e-waste recycling initiative and agree to abide by all the rules related to e-waste management in order to minimize the harmful impact of bar code scanners, bar code printers, mobile computers and their components. We at BBSPL abide by the Ministry of Environment and Forests (MoEF) (called E-Waste (Management & Handling) Rules, 2016), which came into effect from 1st Oct 2016.We at BBSPL believes in educating our customer and request to share responsibility and be part of our initiative in reducing the environment impact of the products. We take pledge that BBSPL in principal will comply with all the applicable laws related to e-waste management Rules 2016 (as Amended). Electronic waste, or e-waste, is a term for electronic products that have become unwanted, non-working or obsolete, and have essentially reached the end of their useful life. As per E-waste Rule 2016, the E waste defined as ‘electrical and electronic equipment, whole or in part discarded as waste by the consumer or bulk consumer as well as rejects from manufacturing, refurbishment and repair processes. E-waste contains many valuable, recoverable materials such as aluminum, copper, gold, silver, plastics, and ferrous metals. In order to conserve natural resources and the energy needed to produce new electronic equipment from virgin resources, electronic equipment can be refurbished, reused, and recycled instead of being land filled. E-waste also contains toxic and hazardous materials including mercury, lead, cadmium, beryllium, chromium, and chemical flame retardants, which have the potential to leach into our soil and water. E-waste contains many valuable, recoverable materials such as aluminum, copper, gold, silver, plastics, and ferrous metals. In order to conserve natural resources and the energy needed to produce new electronic equipment from virgin resources, electronic equipment can be refurbished, reused, and recycled instead of being land filled. E-waste also contains toxic and hazardous materials including mercury, lead, cadmium, beryllium, chromium, and chemical flame retardants, which have the potential to leach into our soil and water. Protects your surroundings- Safe recycling of outdated electronics promotes sound management of toxic chemicals such as lead and mercury. Conserves natural resources- Recycling recovers valuable materials from old electronics that can be used to make new products. As a result, we save energy, reduce pollution, reduce greenhouse gas emissions, and save resources by extracting fewer raw materials from the earth. Helps others – Donating your used electronics benefits your community by passing on ready-to-use or refurbished equipment to those who need it. Saves landfill space – E-waste is a growing waste stream. By recycling these items, landfill space is conserved. Always look for information on the catalogue with your product for end-of-life equipment handling. Ensure that only Authorized Recyclers repair and handle your electronic products. Always call our E-waste Authorized Collection Centres/points to dispose products that have reached end-of life. Always drop your used electronic products, batteries or any accessories when they reach the end of their life at your nearest Authorized E-Waste Collection Centres/Points. Always disconnect the battery from product, and ensure any glass surface is protected against breakage. Do not throw electronics in bins having “Do not Dispose” sign. Do not give e-waste to informal (Kabbadi) and unorganized sectors like Local Scrap Dealer/ Rag Pickers. Do not dispose your product in garbage bins along with municipal waste that ultimately reaches landfills. 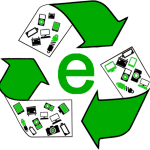 E-waste Recyclers India has signed an agreement with Gati-Kintetsu Express Pvt Ltd. for reverse logistics for Channelization of E-waste to the facility. © 2018 Best Barcode System Private Limited. All Rights Reserved.